Nachman of Breslov (1772-1810) was born in Ukraine, and was the great-grandson of the Baal Shem Tov, the founder of Hasidic Judaism. From a very young age, Nachman was drawn to spirituality and the study of Jewish wisdom. By the time he was just six years old, he made it a habit to visit his great-grandfather’s grave every night, and immerse himself in a mikveh. By 13, he was already married, and attracted his first disciples. 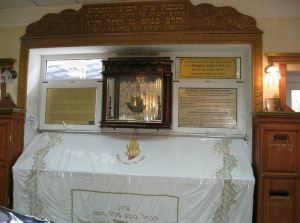 He was soon known simply as Rebbe Nachman. A few years after a pilgrimage to Israel, Rebbe Nachman moved to Breslov and officially founded a new movement of Hasidic Judaism. There he met his most famous disciple, Nathan Sternhartz, known as Reb Noson. Over the following eight years, Reb Noson recorded and published the bulk of Rebbe Nachman’s teachings, which revolutionized the Hasidic world, and the religious Jewish world at large, enlightening thousands with novel interpretations and practical wisdom for living a better life. Rebbe Nachman also produced a number of hymns and songs, including the popular “All the World is a Very Narrow Bridge” (kol ha’olam kulu, gesher tzar me’od) and “It Is A Great Mitzvah To Always be Happy” (mitzvah gedolah li’yot b’simcha tamid). His teachings emphasized simple living permeated with constant joy, and he encouraged people to sing and dance, even during prayers. A major part of his system involves meditation (hitbodedut) and for each person to have a personal dialogue with God, as they would with their best friend. Rebbe Nachman is also famous for his storytelling, and to this day many read his tales, which are full of deep lessons and morals. In 1810, a fire destroyed Rebbe Nachman’s home (along with most of the town of Breslov), and he moved to the town of Uman. Shortly after, he passed away from tuberculosis, aged just 38 years. Since then, countless Jews have been making yearly pilgrimages to his grave in Uman, particularly during the holiday of Rosh Hashanah. In recent years, the Ukrainian town of Uman (with a population of under 90,000) has built an entire industry around these travelers, which number over 25,000 every Rosh Hashanah alone. Rebbe Nachman passed away on the 4th day of Sukkot, which this year falls on the coming Sunday. This entry was posted in Religious Leaders and tagged Baal Shem Tov, Breslov, Hasidic Jews, Hasidism, Hitbodedut, Mikveh, Orthodox Jews, Rabbi, Rosh Hashanah, Sukkot, Ukraine, Ukrainian Jews, Uman on October 8, 2014 by Jew of the Week.